Chef J is at it again – this time sharing perfect pizza dough to satisfy any crowd! There is a common belief that you can’t please everyone. This is correct about 99.99% of the time, and can be especially hard if you practice the growing trend of Meatless Mondays. But there is one delicious exception: Pizza! Pizza might be the pinnacle of cuisine. I doubt that there will be anything anytime soon that can knock that marvelous, cheesy circle off the throne. And though you can have it delivered in under an hour, there is a better way! Pizza is incredibly easy to make for Meatless Monday – anyone can do it! Doing it yourself is not only rewarding (you’ll love bragging to your friends about it! ), it tastes better, it’s healthier, and it’s something that the whole group can get involved in. Everyone at the party can build their own and it’s perfect for the kids! We’ll go step by step through the process; from dough to done. The trickiest part is the dough. People new to the world of home-made pizza are always nervous when it comes to making the glutenous foundation of their next great meal. Fret not; here are a few simple steps that will guide you to your new pie. 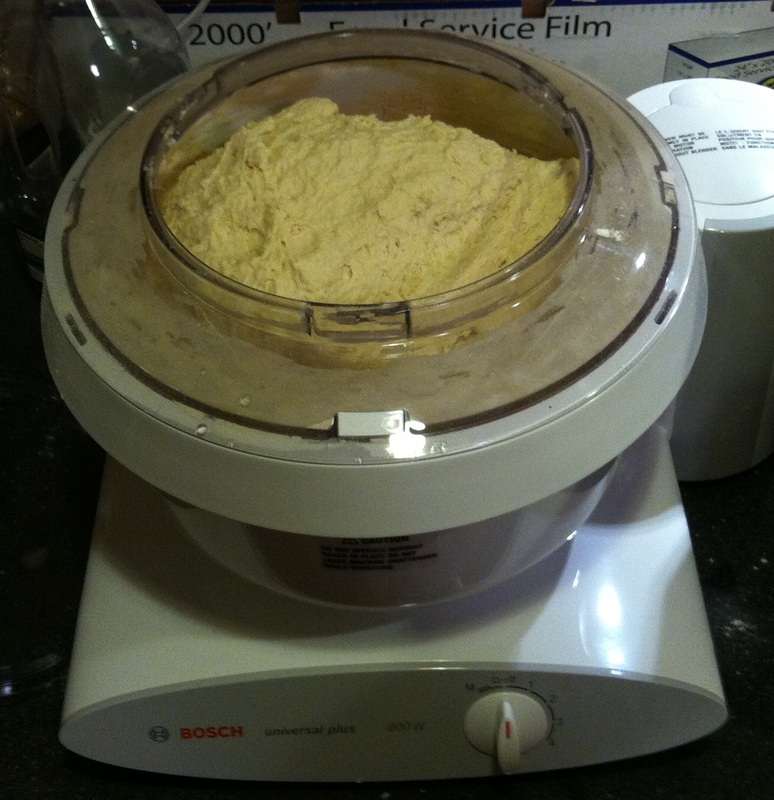 The sponge will start the process of activating the gluten- giving the dough a nice chew. It also develops the flavor by allowing the yeast to bubble and play. Don’t mix it up too much- it should look like lumpy pancake batter. Loosely cover and let sit at room temperature for 8 to 24 hours. This is the part that people tend to get a little scared about. It’s not going to work if you follow a recipe to the letter; you have to go with your gut on this one (it’s all going to your gut anyway!). While your mixer is on low, slowly add more flour, about ½ a cup at a time, letting each addition incorporate. Continue until it starts pulling away from the sides of the mixer. It should be a little sticky. If you are not sure, err on the side of being too wet. Keep kneading it for another 10 minutes. Put the whole mess back into that giant bowl and loosely cover again. The dough needs to rise now to allow the new flour to absorb the liquid, the new yeast to bubble up, and all the gluten that was just worked up to relax. This will take a few hours at room temperature, or overnight in the refrigerator. If you really like a yeasty dough then let it hang out in the fridge. After a while you will see your dough double, triple, or quadruple in size – so keep an eye on it! Punch it down when it starts to crawl out of the bowl. Do this twice. 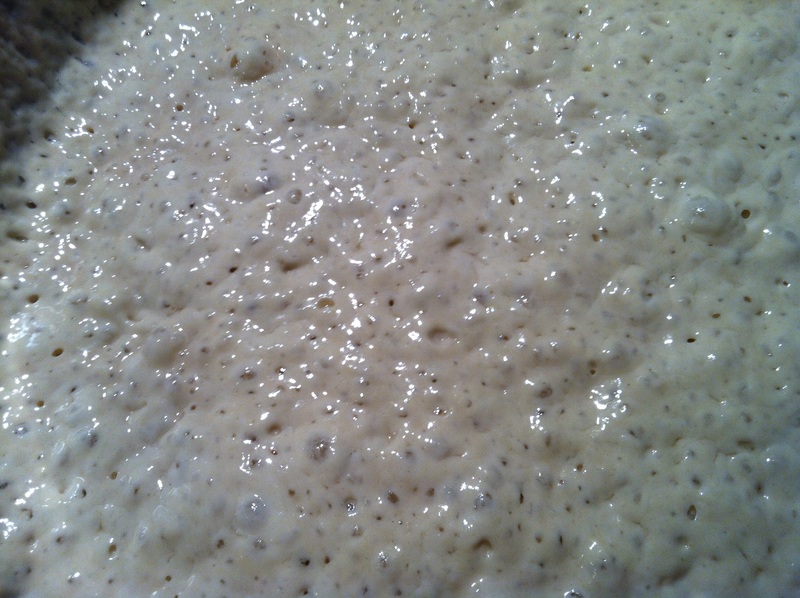 After the second beat-down, when the dough regains its strength and has risen again, it is ready to be formed. Heat your oven to its hottest setting, 450-500 on convection, with a pizza stone or cast iron pan. Generously flour your work surface and move some or all of your dough there. Form the dough into a round lump. Starting from the middle, gently flatten and stretch the dough while rotating it to keep it round. Add flour as needed to keep the dough from sticking. Don’t beat yourself up if it looks more like a puzzle piece than a circle; it takes a bit of practice (it will still taste good!). If you are using a pizza peel to shovel the pie onto your stone or pan, it is important to move the dough onto that before you start topping it, and make sure you have a healthy spattering of cornmeal between peel and dough. If you are hosting a party, have everyone put their dough on a piece of parchment paper before they start adding all of the goodies; this will make it a lot easier and cleaner to get them into the oven. Spread on a bit of sauce and top with veggies, cheese, whatever you want! Since we’re talking Meatless Monday, some of my favorite veggie toppings are corn, olives and squash. Throw the pizza into the oven and give it about five minutes, until the crust is golden and the cheese is bubbly. Depending on the size of the pie and how much deliciousness you have piled onto it, the cooking time will vary. Limiting toppings will help the pizza cook evenly and quickly. When it’s done make sure to let it cool a bit before digging in – we’ve all burned the roof of our mouth due to pizza impatience! The best part is you don’t even need to tip! How’s that for Meatless Monday? !